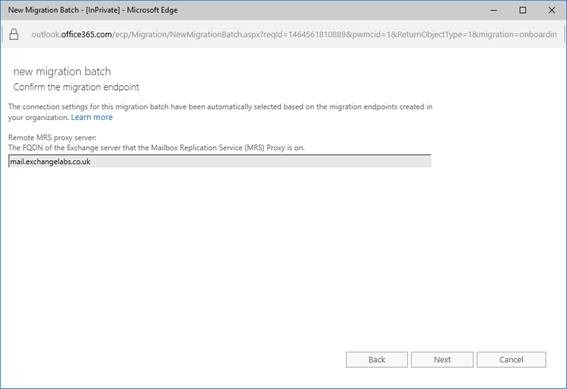 In this series, we’ve spent time making sure the environment is ready for Exchange Hybrid before implementing the Hybrid Configuration using the Office 365 Hybrid Configuration Wizard. We then performed a number of post-configuration steps to enable fuller functionality, before beginning core service tests ensuring we can create new Mailboxes and use core Autodiscover services. In this final part of the series we’ll complete our testing. We’ve tested mailbox creation and Hybrid autodiscover. We’ll now test mail flow, free/busy, calendar sharing, public folder access and finally test mailbox moves. As mentioned in the previous part of this article, these are just basic tests – it is important to test client connectivity from the clients you’ll use. Mail flow between Office 365 and the Hybrid servers will attempt direct connections. As part of the pre-requisites the correct firewall rules should have been added, however even with the correct firewall rules in place it is still possible to get caught out. · Firewalls blocking SMTP headers, often known as “SMTP Fixup” on Cisco devices. This prevents TLS (secure) SMTP communication. You’ll typically see this when troubleshooting via Telnet; the STARTTLS command will be blocked in response to the EHLO command and most visibly the server name will be replaced by a row of asterisk (*) characters. · The Hybrid Server may be on Microsoft’s private Office 365 Real-Time-Blocklist (RBL). Although fairly uncommon, Microsoft do occasionally block IP ranges that are not listed on other public RBLs. This will cause email to bounce with instructions on removal. Removal typically takes just a couple of hours, but plan for 24-hours. Testing mail flow itself is simple; using the test mailbox in Office 365 and an equivalent on-premises mailbox attempt to send email both ways. 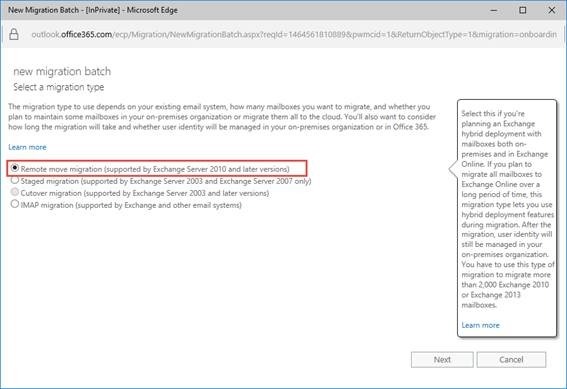 If you have multiple Hybrid Servers sending outbound email, you may have to send a number of test messages to validate in the received message headers that all servers are able to connect to Office 365. After validating mail flow between on-premises and Office 365, test mail flow between an Office 365 recipient and an external email address. In addition to just connecting the two organizations together, the Hybrid Configuration Wizard configures connectors either side to trust the email flowing from each respective environment. After configuring the Out of Office messages, re-send test messages. The expected result will be that on-premises and Office 365 recipients received internal Out of Office replies, and all external recipients receive the respective external message. 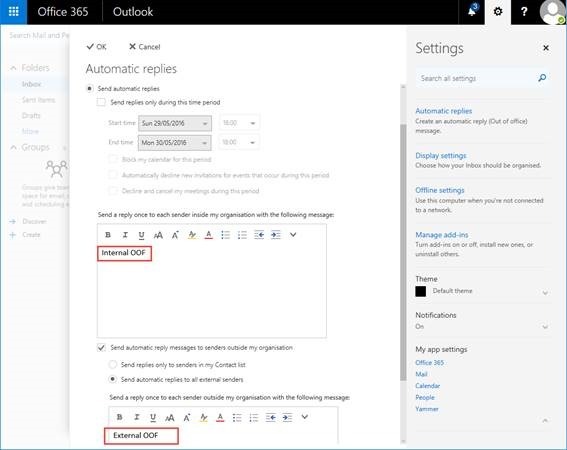 If you receive external Out of Office reply messages then it is likely that during the troubleshooting process for mail flow the connectors have been altered; for example you disabled the Outbound connector in Office 365. If changes have not been made then another common reasons is that although all custom domains have been registered with the Office 365 tenant, not all were added to the Hybrid Configuration Wizard. This results in mail from Office 365 to those recipients flowing via your existing MX records and anti-spam solutions. For many organizations, the ability to check availability is a critical function and must work during co-existence. In part one of this series, much of the pre-requisites were aimed at helping ensure this feature works correctly. We will perform two tests to verify connectivity in both directions. 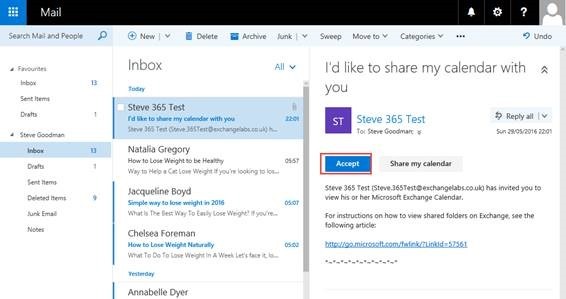 To prepare, create test appointments in both on-premises and Office 365 test mailboxes. First log in to Outlook Web Access in Exchange Server on-premises. Attempt to schedule a new meeting with the Office 365 mailbox. The availability should be displayed correctly. If availability is not shown this typically means outbound connectivity from the Exchange Server and Office 365 isn’t working correctly. Next check availability from Office 365 to on-premises, using the same method. Availability for the on-premises mailbox should be displayed. 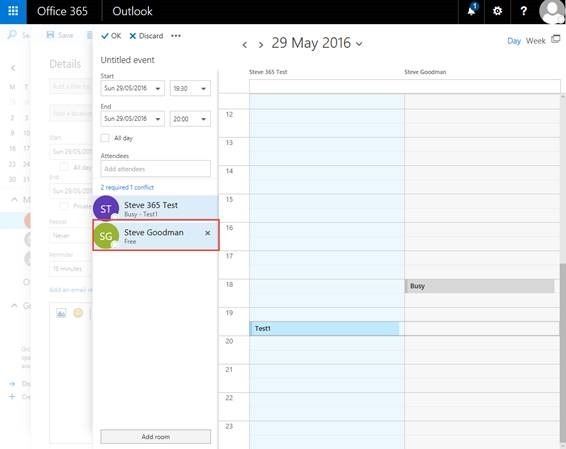 Rich access to calendars between on-premises mailboxes and cloud mailboxes uses the same underlying technology as Free / Busy, so testing functionality should be a formality. 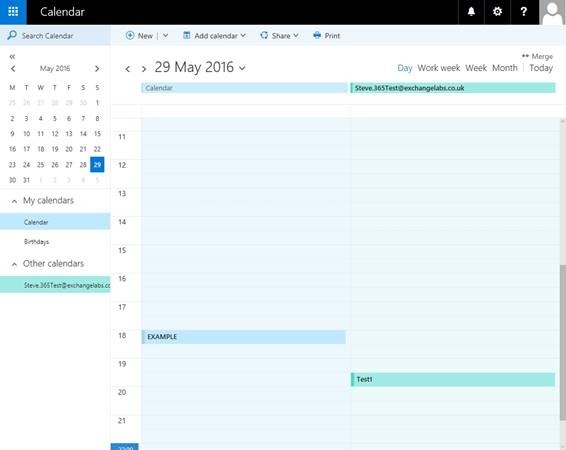 You will need to re-share any calendars that are used between accounts on opposite sides of the Hybrid Relationship, though once all calendars are migrated to Office 365 existing permissions set can be used. A new Sharing Invite will be displayed. Enter the other test mailbox and then choose to share Full Details, then press Send. The sharing invitation should be received by the opposite test mailbox. If sharing is not configured correctly (as performed in part three of this series) then an iCal/HTML link will be shown. If sharing is set up correctly then an Add Calendar button should be displayed. 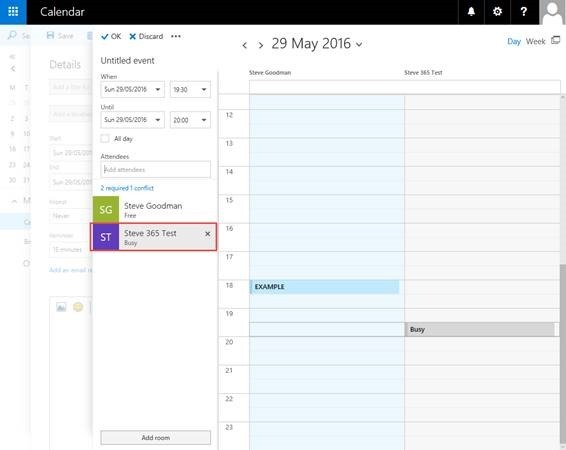 After choosing Add Calendar, wait a few moments and then view the mailbox calendar. The other test mailbox calendar should be displayed. 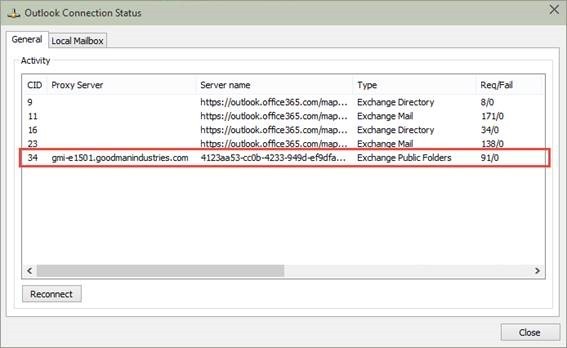 Access to Public Folders relies on Client connectivity from Outlook to the on-premises environment. No access to Public Folders is provided in Outlook Web App. The final test we will perform validates we can move mailboxes to (and then from) Office 365. Migration of mailboxes requires access to a component on Exchange known as the MRSProxy, or the Mailbox Replication Service Proxy. This runs within the Web Services virtual directory. 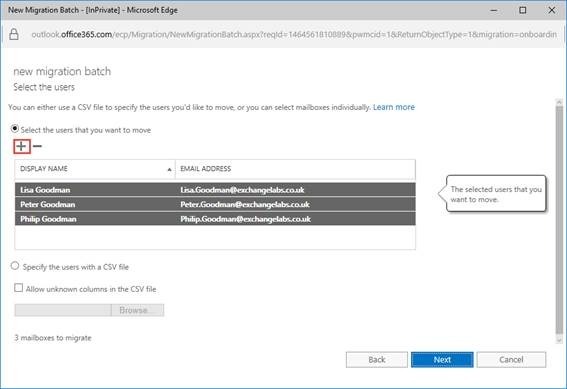 All mailbox moves either to or from Office 365 are initiated from the cloud and connect to this component. Enter an appropriate name for the migration batch. From the Target Delivery Domain menu, select the routing domain (<tenantname>.mail.onmicrosoft.com) from the drop-down list, if it isn’t populated by default. On the final page of the wizard, select an address to send report notifications to. After selecting Browse you can either select a recipient from the Global Address List, or enter an email address. 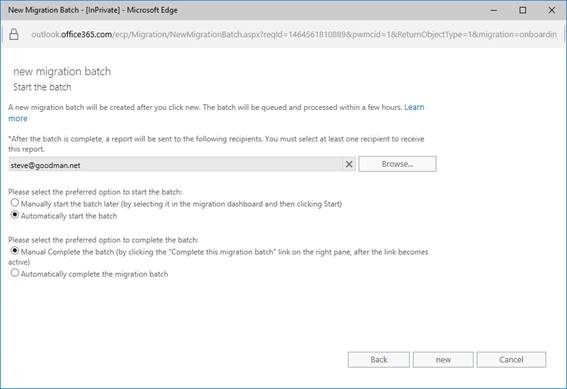 Options are also available to start and complete the Migration batch. The option to start simply means we will create the configuration in Exchange Online, then start performing a sync of mailboxes later. The options for completion define what action to take after the initial sync completes; either to perform a final sync and switch – Automatically complete, or to leave the synced mailbox as is until users have been notified they will be switching – Manually Complete. The mailbox should complete moving to Office 365. After successfully testing with a client mailbox, re-test mailbox moves with working clients to ensure the before and after experience works well. 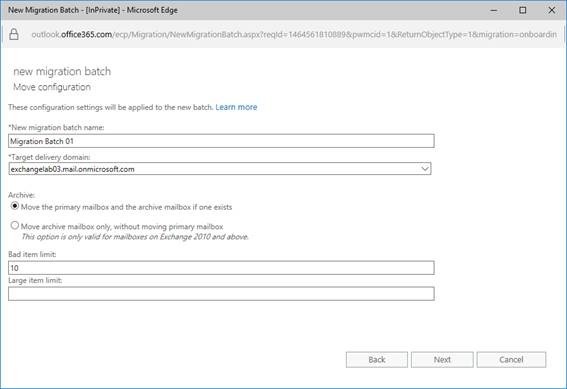 In this multi-part series, we’ve completed the basic configuration needed to get a well-functioning Exchange Hybrid up and running, using the Office 365 Hybrid Configuration Wizard. August 1, 2016 in Office 365.